Asian American LEAD Updates! 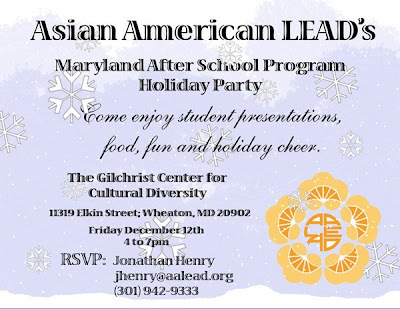 : Maryland After School Programs Holiday Party. Maryland's High School and Middle School After School Programs will hold their annual Holiday Party this Friday, December 12th. Our celebration will be held at the Gilchrist Center in Wheaton, Maryland. The purpose of the Holiday Celebration and Youth Event is to celebrate the holidays and display some of the work done by students in AA LEAD. There will be food, music and games, as well as displays by students who will be showing off their welcome wall at the Gilchrist Center. Everyone in attendance will have an opportunity to learn about AA LEAD and what our programs do to help serve the Asian American community. Parents, students and community members are all welcome to attend. Please RSVP or return your student's permission slip by December 11th, 2008.